Coffee shops are much more than just a place to buy coffee. They have become a place to work, socialize or just relax. And they are everywhere! Each new coffee house or bistro is giving you a different experience and variety of coffee to try. Amid all of that steaming hot competition, you need to find a way to draw in the customers. It's time to heat up your marketing efforts for your coffee shop. Give them a reason to experience your bistro with coffee gift cards, coffee club membership cards, coffee loyalty cards, coffee shop rewards programs and other promotional tools. A coffee gift card is the most cost-effective way to get customers in your door to experience your coffee and environment. 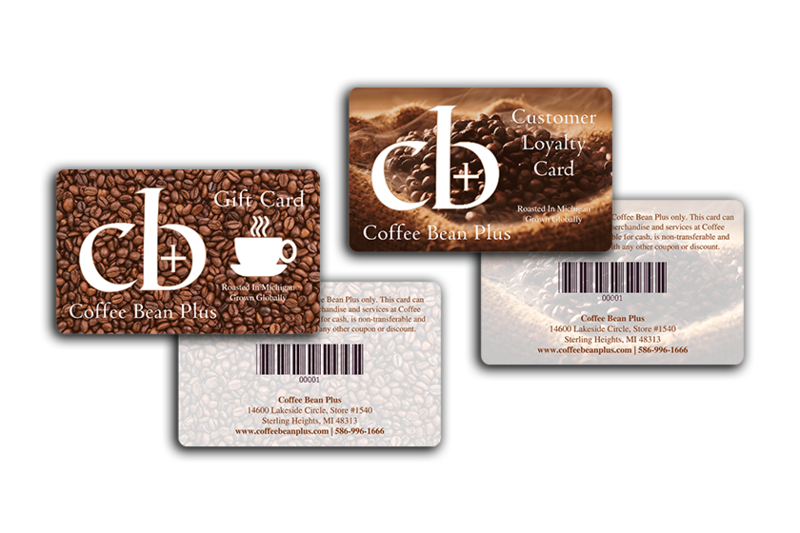 Make your business their regular meeting spot with membership cards for your coffee club, earning them rewards for their loyalty while giving you more insight into their buyer behavior. Enticing customers to continue to get their coffee with you helps generate revenue and promote growth. We have other fantastic marketing tools that can help take your brand to the next level like coffee shop menus, coffee coasters, and coffee cup business cards. These tools help create a cohesive look that will stand out and have your customers coming back for another cup. Have multiple coffee shop locations? Smart Connect: Restaurant is an efficient method for ordering and tracking coffee shop menus, gift cards, coffee loyalty card, table signage and coffee coasters across multiple coffee shop locations. Whether you are a franchise or single location coffee house, we have a solution for you. Want to heat up your coffee shop marketing, but don't know how to get started? We make it easy! We are here to help answer all of your questions and help you find the perfect marketing tools for your coffee club or bistro.